Some readers may have been following on other blogs a debate about how the number of ordinations in the last few years compares with earlier times. It started with the National Office for Vocations publishing some obviously erroneous figures, from which it was asserted that the current numbers are vastly higher than the numbers for the 1930s and 1940s. These are numbers of priests, so to get to ordinations, we would need to know the number of priests who die or leave the priesthood each decade. I do not have this information. However, the trend is very obvious. 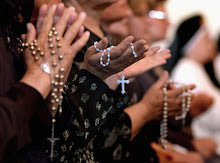 The number of priests increases each decade until 1971after which it decreaseseach decade. Analysis can only be as good as the raw data, and I have some suspicions about some of the figures. Can anyone explain th big increases indicated in 1881, 1911 and 1941? One thing that struck me last week when I was at the priest and server training conference in Leicester was the number of prospective priests amongst the servers. Included in the twenty or so laymen who had enrolled for the purpose of learning to serve, or of improving their serving skills, there were at least four who were intending to pursue their vocation to the priesthood. Most of these had made applications to their bishops or diocesan directors of vocations, and been advised to go away for a period and gain a little experience of the world before resubmitting an application. Thinking back over earlier training conferences, I recall that in each of the last four years there have been a significant number of young men who were quite open about their intention to pursue a priestly vocation. Some are now in seminaries, including those of the traditional societies, and others are still waiting to be accepted. Meeting so many of these prospective priests, one cannot help but feel that in future decades, those parishes lucky enough to have a resident priest will be in good hands. This view tends to be reinforced whenever one meets current seminarians or indeed newly ordained priests. The quality seems pretty good. The downside is that, however one looks at the statistics, the number of active priests in England and Wales is likely to continue to decline for another twenty years. The next ten years is fairly predictable as most of the priests that will be ordained in this period are already in seminary or in a process of discerning their vocation. For the situation to improve after that, there would have to be fairly major upturn in the number of vocations. There are some signs that this is already happening in a minor way. A factor that is rarely taken into consideration when predicting the numbers of future priests is the selection process. Of course we will never know what criteria bishops use when deciding whether to select or reject a particular candidate. However, my impression is that many of the young men that I have seen taking part in LMS training conferences would not have passed the selection process a decade ago. They would have been considered over pious, too traditional, or possibly branded as insufficiently mature. Fortunately these views are changing. 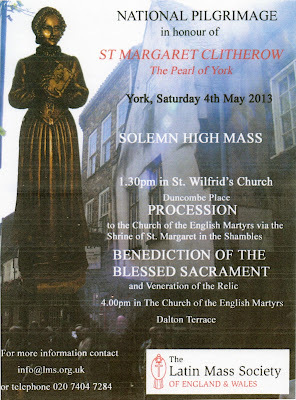 So this leads me to wonder: Could it be that the shortage of priests need not have happened? Is it, at least in part, due to the rejection of many candidates who would have made excellent priests? In his address to participants at the recent priest and server training conference at Ratcliffe College, Bishop McMahon made reference to the practice of referring to the traditional Mass. He suggested that the regular use of this expression by the Latin Mass Society was the cause of much irritation to our opponents, and that the use of an alternative expression might improve our public relations. He accpted that in one sense of the word, the sense of having a long past, the use was fully justified. However, he also argued that there was another sense of the word, whereby the novus ordo Mass also had claim to the description traditional. I think he was referring to the fact that the modern Mass is the latest stage in a long development of the Mass, and therefore part of the living tradition. Of course, there is plenty of scope for argument over the meaning of words and the appropriateness of their use an any particular circumstance, but Bishop McMahon certainly had a point. This is that the frequent use of the this particular word by the Latin Mass Society serves as a rallying cry for our opponents. He suggested that we come up with an alternative. All of these have some disadvantages, and many of them cause irritation to our opponents. Some of them, such as the extraordinary form, cause irritation to me. If I had to choose one, I would go for Tridentine Mass, because it has been used for a long time, and most people would know what you are talking about. I would welcome a debate on the subject, so please send in your comments. It comes as a very great surprise to me that Russia features so near the top of the list and that Ukraine and China are there at all. One might have expected more interest from Ireland and Australia. As someone who has an interest in statistics, I am aware that small samples, or samples taken over a relatively short period of time are not reliable, so I shall continue to monitor the figures to get a better picture. It is also interesting that many of the visits are as a result of the link with Fr Brown's blog, Forrest Murmurs. 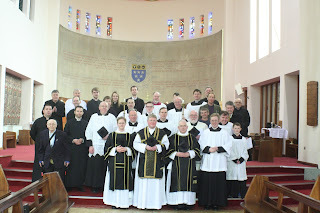 I have just returned from the Latin Mass Society's Priest and Server Training Conference, which was held at Ratcliffe College in Leicestershire last week. A total of about 60 people attended part or all of the conference, which extended over five days. The main purpose of the conference was to provide training to both priests and servers in the older form of the Mass. On this occasion, the first two sessions, on Monday afternoon and Tuesday morning, were given over to the teaching of basic Latin. Whilst this could only be a very brief introduction to the subject, it proved useful to those who had little or no knowledge of ecclesiastical Latin. For the main part of the conference (Tuesday afternoon, Wednesday and Thurdsday), the participants were divided into small groups, and tuition was provided to suit the needs of each group. There were three groups specifically for priests, two covering Low Mass and one Missa Cantata. For the servers, there were also three groups covering Low Mass and Missa Cantata. A further group, which included both priests and servers, studied Missa Solemnis. Each day, there was a programme of liturgies, which included Lauds, the conference Mass, Vespers, Benediction and Compline. In addition there were several private Masses early each morning. With such a range of liturgies, both priests and servers had opportunities to put what they had learned into practice. The highlight of the conference came at the beginning of the week. Bishop Malcolm McMahon kindly agreed to celebrate the opening Mass on the Monday, which happened to be the transferred feast of the Annunciation. After the Pontifical Mass, Bishop McMahon stayed for a meal and then addressed all the participants. The theme of his address was an attempt to heal the rift that exists in the Church between supporters of the usus antiquior and those who see no special value in it. One suggestion that he made was that enthusiasts for the extraordinary form should stop describing it as the traditional Mass, as this description was a source of great irritation to many people. I will deal with this issue in a later post. Besides home based priests, the conference attracted one priest from South Africa, three from Poland and three from Scotland. 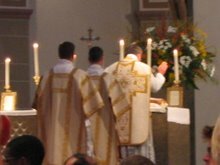 It was also very pleasing to discover that, amongst the servers, there were four that were intending to follow a priestly vocation.